Because of my position as a fashion blogger, I am the first person my friends and family approach whenever it comes to quesions about anything fashion related. Through the years, I have been asked MANY MANY times where they can have personalized t-shirts of their own designs made by the piece and I have always come up empty handed. Great news for all of you....Inksquad is back and this time, there is no more voting involved. All you have to do to have your own design printed is upload it to their site, pay, and wait for your shirt to arrive at your doorstep! 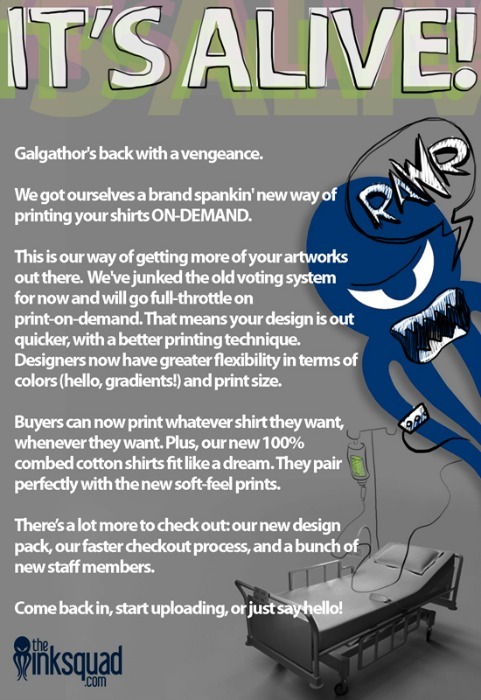 INKSQUAD: a simple three step t-shirt customisation site that allows you to design, upload and order your design on demand. What is even more awesome is that when other people buy your print you get 5% of the royalties! THE T-SHIRT: Each printed t-shirt costs only PhP 490.00 and that includes shipping - a price more reasonable than most t-shirt private labels on the market. The t-shirts used are made from 100% cotton and manufactured with the same quality and standards as a renowned high-end international t-shirt brand in the Philippines. PAYING ON INKSQUAD: InkSquad allows for multiple payment methods including AsiaPay, Paypal and bank to bank transfer. GETTING PAID ON INKSQUAD: At the end of each month, you can request to have your earnings from people who bought your designs sent over to you. THEIR MISSION: To get designers from all over the country to collaborate and share their art with the world. In addition we want to let everyone out there express their individuality by wearing their humor, interests, pride and persona. COMING SOON: Our new online t-shirt designer should be up and running by early next year and will feature a much wider selection of colours along with a web t-designer which allows you to upload your designs and few them real time. Super easy right? And what I love most about it is that they don't require a minimum order unlike most t-shirt customization sites. Plus, you can't really beat the P490 price tag! 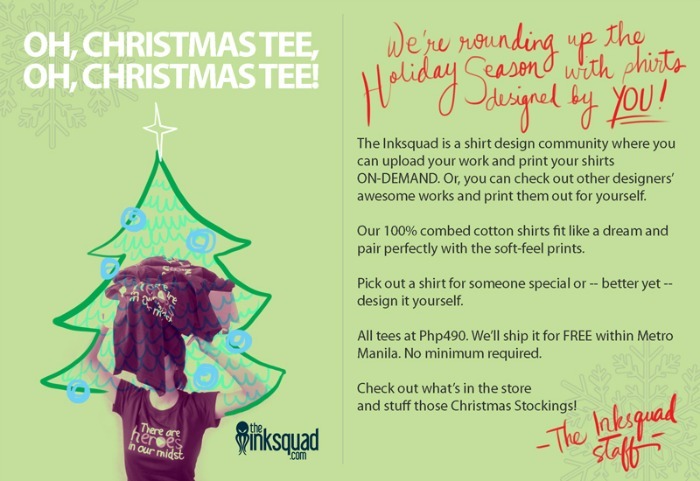 Get your imagination working and dream up your own designs, visit http://theinksquad.com/ for inspiration and more info.